PJN Steel Fabrication roll their own Purlins, Cladding, Gutters & Downpipes. PJN Steel Fabrication also maximise efficiency through the implementation of beamline processing to ensure accurate, timely & efficient manufacturing of structural components. This means that virtually every component of your shed is manufactured in house ensuring the highest standard at exceptional prices. All structural steel is shot blasted, zinc primed & finished with a heavy duty colour coat. Hot dip galvanising is also available if requested. This ensures a high quality, long lasting attractive finish for your building. What does this mean for the client? PJN Steel Fabrication's comprehensive in house processing and rollforming operation ensures strong quality control and the ability to cut out the 'middleman' cost and prevent waste. This allows savings to be passed straight to the client and results in a heavier, higher quality shed in comparison to competitors. PJN Steel Fabrication have 2 purlin mills capable of rolling both 'C' or 'Z' section. Sizes range from 100mm to 400mm in size. PJN Steel Fabrication roll roof thickness cladding in both corrugated and Tee-dek (5-rib) profiles. Cladding comes in a range of 20 colours as well as zinc & any length from 600mm up to 20 metres. PJN Steel Fabrication's gutter and downpipe machines produce slotted gutter, barge & downpipe in your choice of 20 colours. Gutter and barge are also produced in zinc. 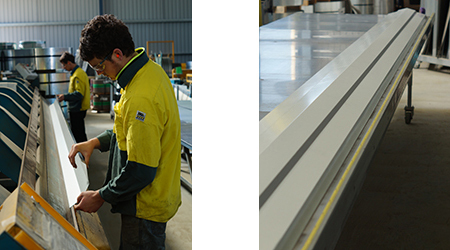 Flashings are also manufactured in-house at PJN Steel Fabrication, ensuring a quality finish. PJN Steel Fabrication manufacture all their own PA & sliding doors, all engineered and built in compliance with wind ratings, industrial specifications and quality standards. If you are considering the purchase of a new rural, commercial or industrial shed, PJN welcomes the opportunity to provide expert advice and obligation free quotes.